55% linen / 45% cotton. Cap sleeves. Stylish smart/casual round necked top with open front and 2 buttons (plus spare included). LADIES TOP FROM EVANS PLUS SIZE 30 WHITE EMBROIDERED with silver thread. Condition is Used. Lovely condition. Ladies versatile and flattering loose fit summer gypsy top Size 18 From Atmosphere VGC Please ask any questions Always combine postage, as in as many items in one parcel sto save on postage Pay pal please within 24 hours of winning bid Any problems, don't leave negative feedback,I always wash and make sure items are in good condition, but sometimes an item slips thru the net so please email me first, if their is a problem with the item not mentioned you will obviously get a full refund and return postage paid, no questions asked....i am a very fair and friendly ebayer!! My feedback is extremely important to me......thankyou for looking at my items. 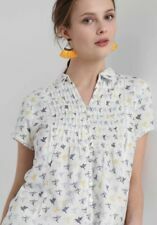 A TU Ladies Navy & White Spotted Top with Butterflies. Small Cap Sleeves. Small Pocket on the Front. Length 25". 100% Cotton. Stunning Chinese style blouse with beautiful flower embroidery in black and white. Lovely frog detail to do up the front of the blouse. Cap sleeves. C but never worn. CAn be worn over a skirt or trousers or tucked in. Ladiesnwhite next Blouse. Fine linen. Cap sleeves. Gently shaped and with narrow side ties. In good clean condition. Machine washable. You can tumble dry and iron. Pretty little button through top / blouse. Versatile M&S Autograph White Spot Print Shirt Size 8, perfect for office and evening wear, and I've found it wears well with just about anything! FRILLED HEM LINE & NECK LINE. BEAUTIFUL TOP,IN GOOD CONDITION. BUTTON DOWN. Black & White Peplum Sleeveless Top Size 12. Condition is Used. Dispatched with Royal Mail 2nd Class. Beautiful Grey Pink White Blouse Tunic Top- by WALLIS. NEXT COtton White BLOUSE S16 Fitted Style . Condition is Used. Dispatched with Royal Mail 2nd Class. 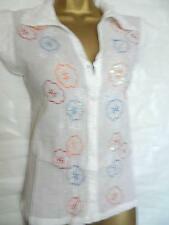 Lovely NEXT White Blouse Top Cotton Embroidered Size UK 16. Condition is good Used (worn a handful of times at the most) . Dispatched with Royal Mail 2nd Class. White Stuff Ladies Top Size 10 Faces On (35.00) NEW, LABELS. 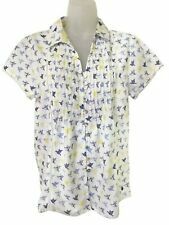 White Stuff Ladies Top Size 10 Faces On (35.00) NEW, LABELS.. Condition is New with tags. Dispatched with Royal Mail Signed For® 2nd Class. Pretty Boden 100% cotton top with button detail at front and plaited cotton trim around neckline. Please see photos for measurements. Posted by Royal Mail Second Class. This is a beautiful white cut-work lace blouse from the 'Really Curvy' range that Pepperberry is renowned for. It is pull-on, over the head, with a side zip for ease of access, and a button at the back of the neck. White relaxed fit top with oval shape pattern. French Connection Top. Size 8 100% Cotton,machine washable. Want your order even quicker?.